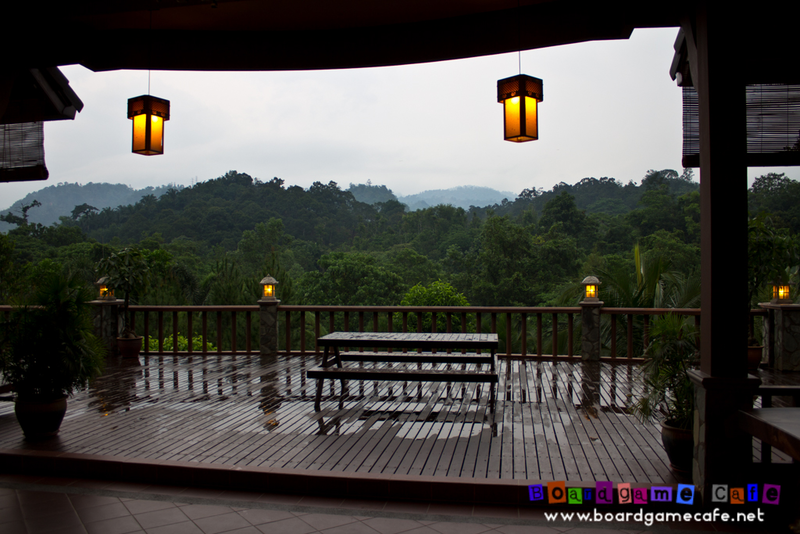 When me & waiyan sat down early last year to plan how we wanted to run the 3rd iteration of our annual boardgame retreat, she suggested we picked a different type of location from the last two we did ie Genting Highlands (2010) and Port Dickson (2011). 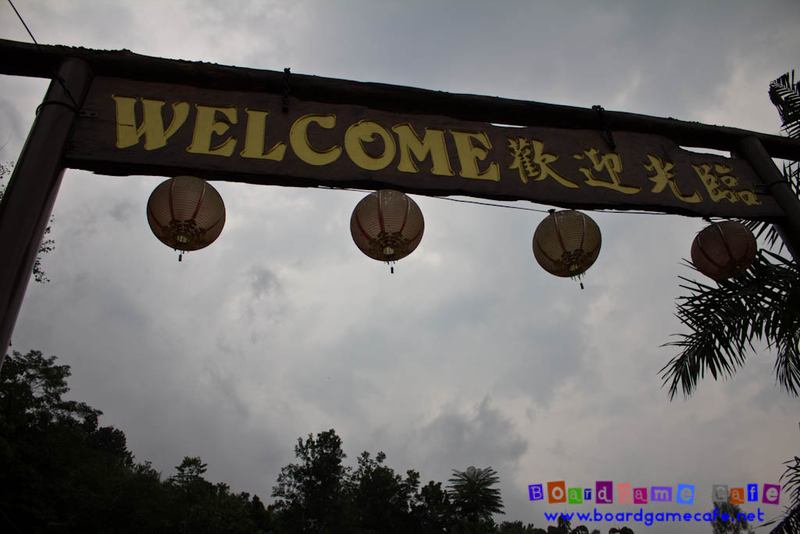 waiyan suggested we go back to nature, and took up the challenge to scout for a suitable place for us to host the retreat. When she came back with the suggestion for Kin Tick Orchard Village, we were not sure yet how that’ll turn out. This was one of the pic of Kin Tick we could search from the Internet, and it didn’t look too bad. So we decided to do a recon trip to Kin Tick to check out not just the ambience of the place but also whether it’s suitable for us to host the retreat. 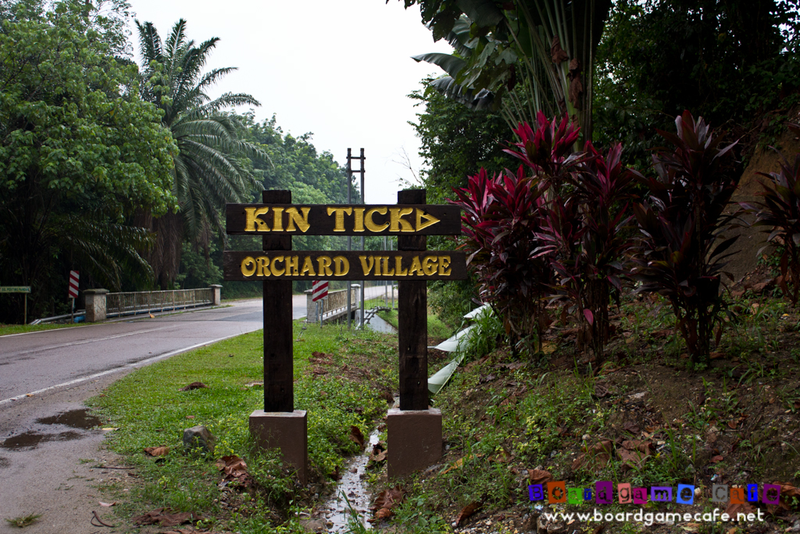 The actual resort area of Kin Tick is separated from the main road by a river that runs across. There’s no foot path or bridge for us to cross the river. Seems like the only way across is on the 4WD which was kindly provided by Kin Tick. I suppose a heavily loaded Kancil might do the job too. 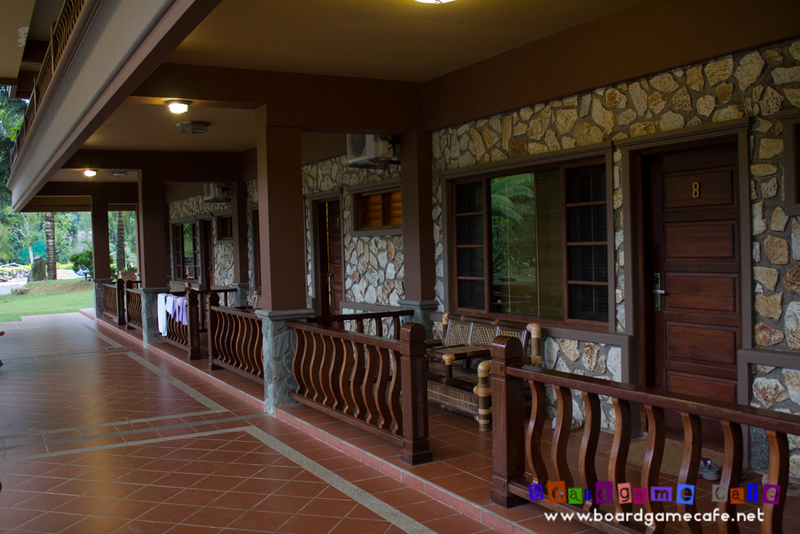 We were pretty impressed when we first stepped into Kin Tick’s resort. Lush greens everywhere and if nature is what you like, you couldn’t have asked for a better place. 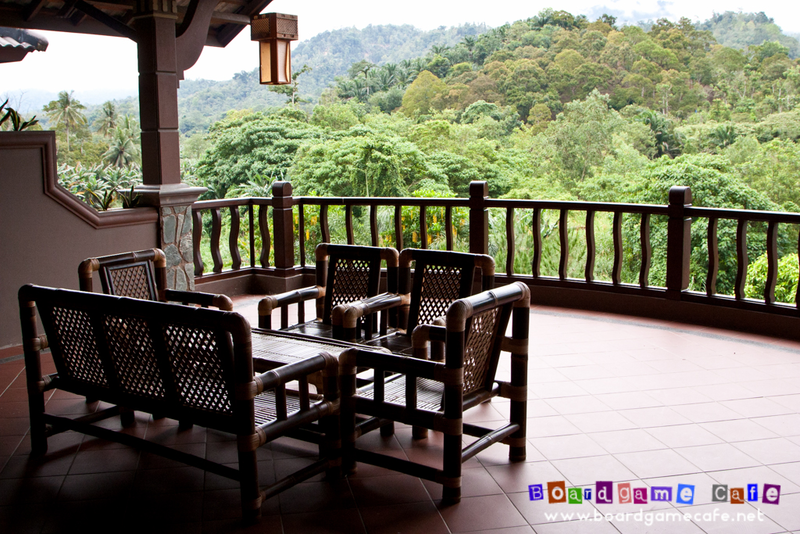 Kin Tick is an orchard converted into a resort – and being located in Bentong, it’s a mere 1.5 hours drive from Klang Valley making it ideal for our Retreat from both the travel time and theme factors. 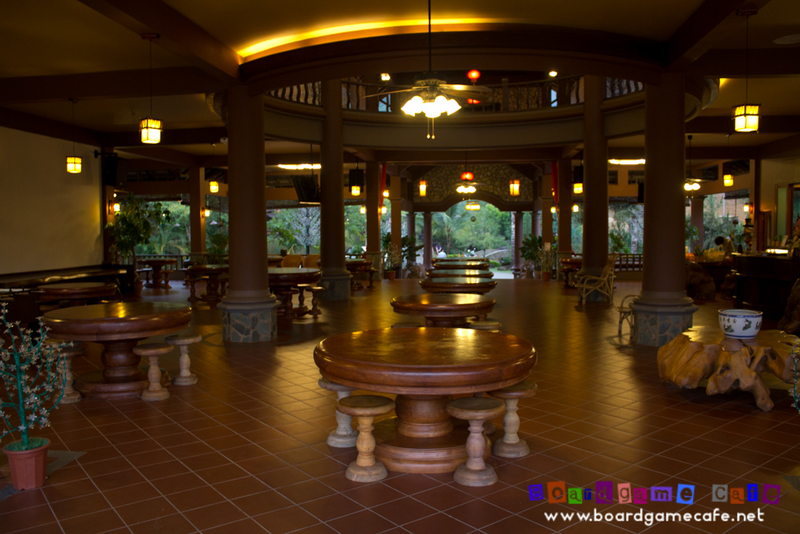 The impressive Reception Hall that greeted us on our arrival. 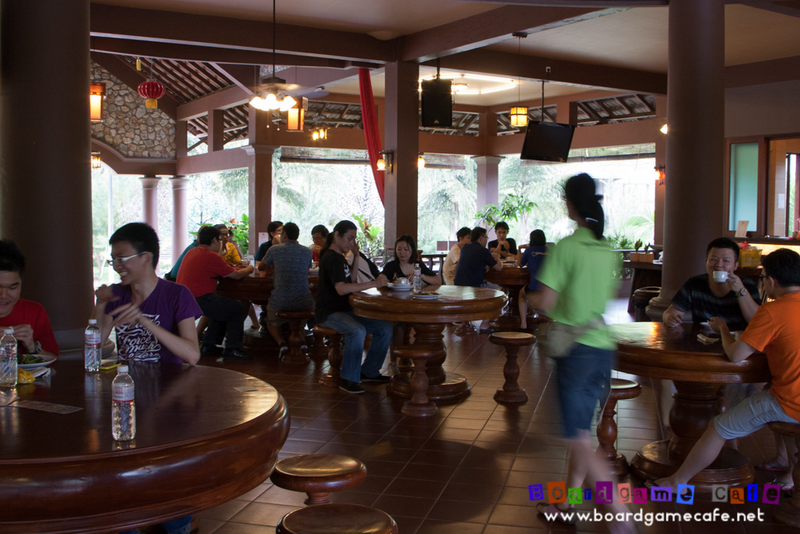 This is their Reception area which also doubles as their dining hall. 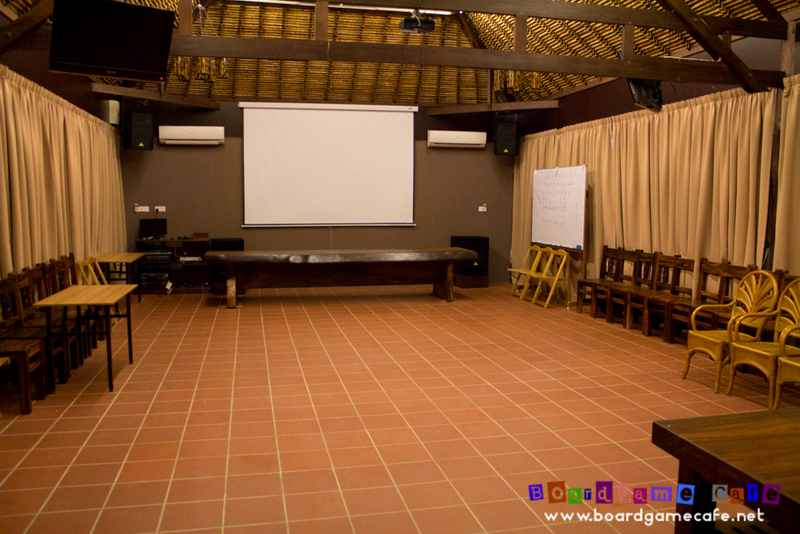 We thought setting up those tables to host our boardgame sessions would be great – definitely better than playing inside a stuffy function room. They do have a function room and it’s not small too. 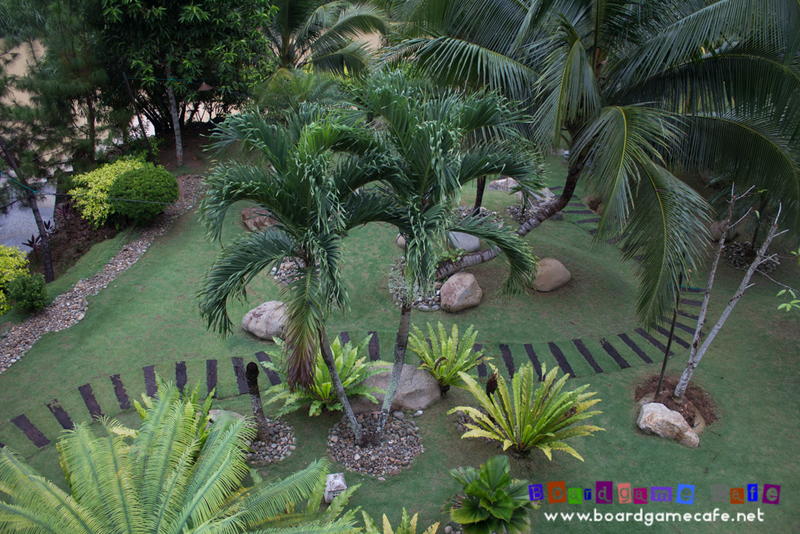 But then again, we wouldn’t want to be asking our gamers to drive all the way from the concrete jungles of KL into this lush green paradise – ONLY to play boardgames inside another concrete meeting room? The balcony area in their reception overlooking an awesome view outwards into a never-ending acres of greens. This is the area outside the stone rooms (where we’ll be placing the gamers for the night). 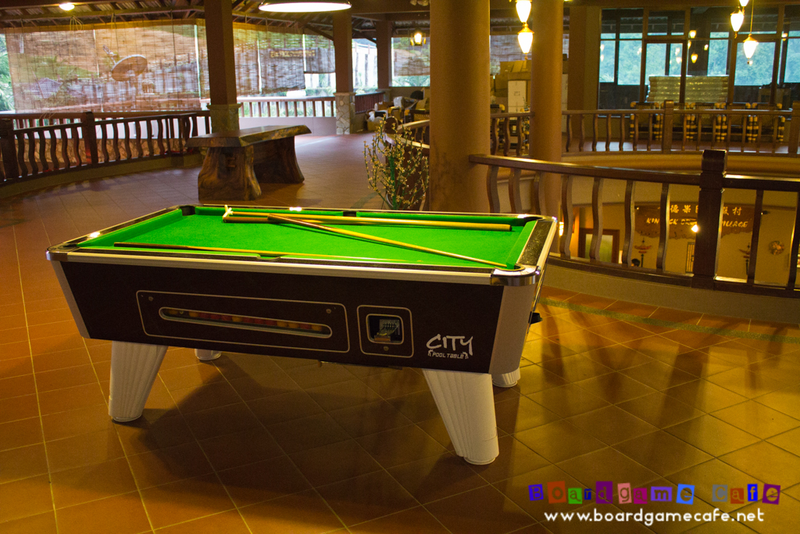 It comes with the same nice wooden tables as in the Reception so we thought this would make for a nice After-8 gaming session. p/s Turned out, this area became our main playing area (more on this later when we report about the sessions of Day One and Day Two). In hindsight, I’ve to say Kin Tick was an inspired suggestion by waiyan. I personally felt Kin Tick was marvelous and the best of the three locations we’ve hosted our retreats. Once we managed to confirm the accommodation at Kin Tick, we sent out an early bird invite to our past Retreat attendees to offer them first dibs on this event. We knew most of our past attendees enjoyed the previous Retreats and have been asking us to give them a heads-up when we are hosting the next one. 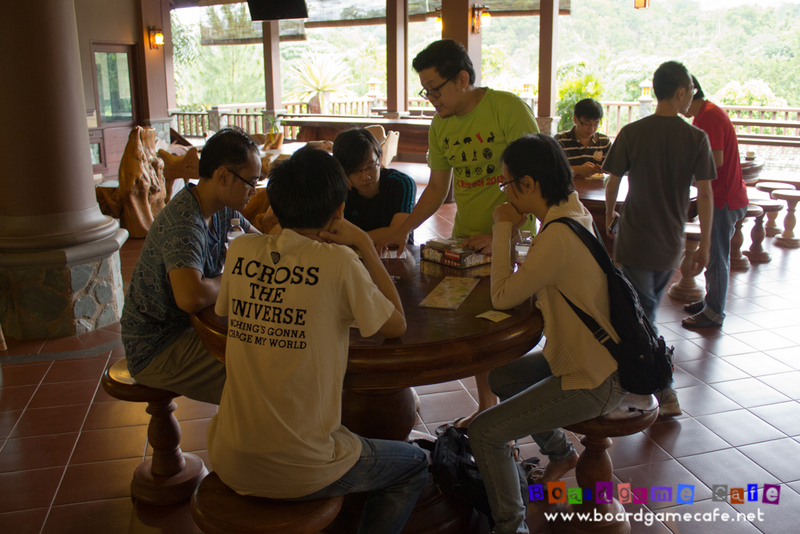 Our initial plan was to host 6 tables of 24 gamers. The good responses meant we decided to extend it to 7 tables of 28 gamers, and we quickly filled up our seats shortly after announcing the BGC Retreat 2013 details. We were even contemplating whether to increase the tables to 8 (or even 10) but thought we’ll dial-back to 7 tables in order to manage a good experience for the participants rather than increase the pax count unnecessarily. 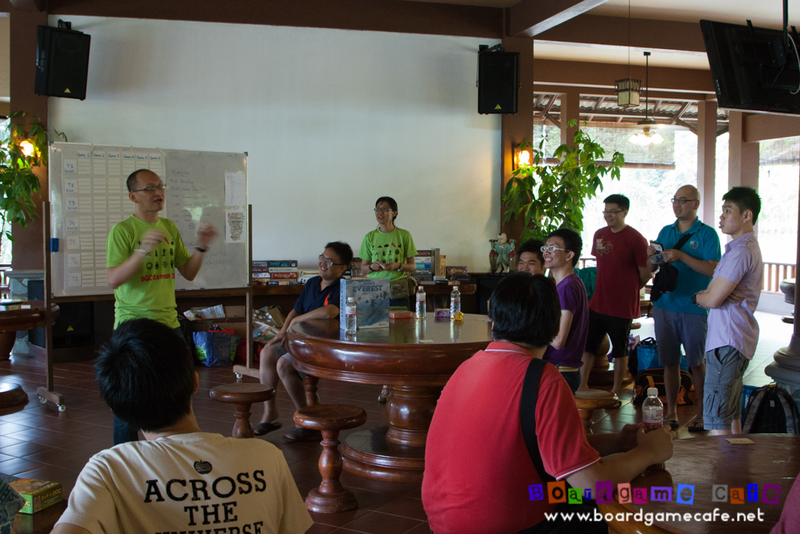 If you wish to find out more about the Retreat programme, how much it cost, what’s included (and not included in it), and how do you get hold of the special 40% Retreat discount bonus (redeemable on any one boardgame of your choice), go to our BGC Retreat 2013 invite post. 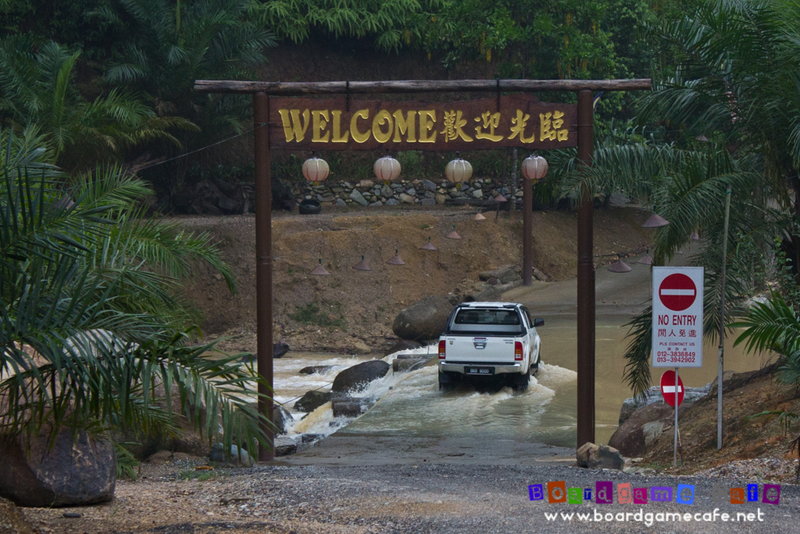 As mentioned earlier, Kin Tick’s resort is separated from the main road by a river, and the only way to get across that is in an 4WD. So we’ve been jokingly informing all our attendees that Game Zero of the Retreat starts with the challenge of everyone driving their cars across the river! How we wished that had happened. 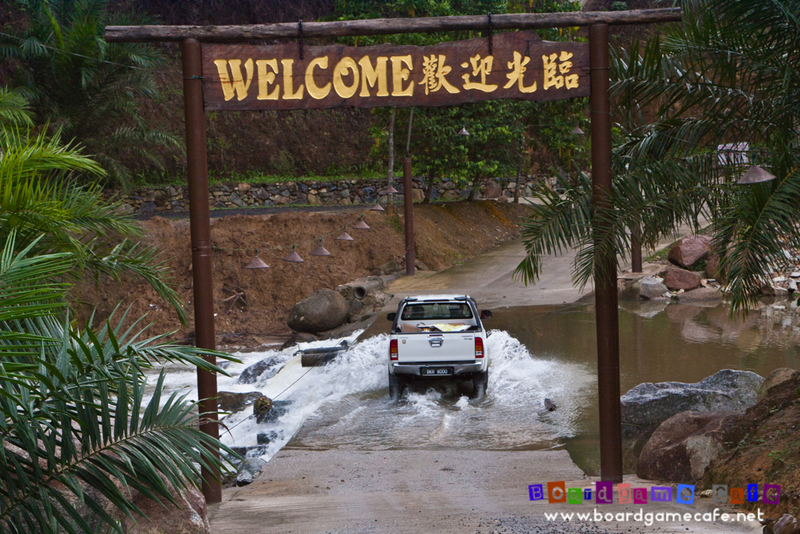 Anyway the reality was that everyone got chaperoned safely across the river by Kin Tick’s 4WD so that we can start our actual GAME ZERO properly. Yes boring, we know. The first morning of the Retreat started with CK (Jeff) welcoming everyone and giving them a helicopter tour of the Retreat’s programme for the next two days. Our Boardgame Retreat can be categorized as a semi-competitive event, in that you score points for achieving 1st, 2nd or 3rd positions (in a 4-player table) and over the course of the 2 days, the person with the highest score is declared the Retreat Champion and gets to win a brand new MOUNT EVEREST game from Portal, fresh off Essen Spiel 2013 and (afaik) the first copy in Malaysia! 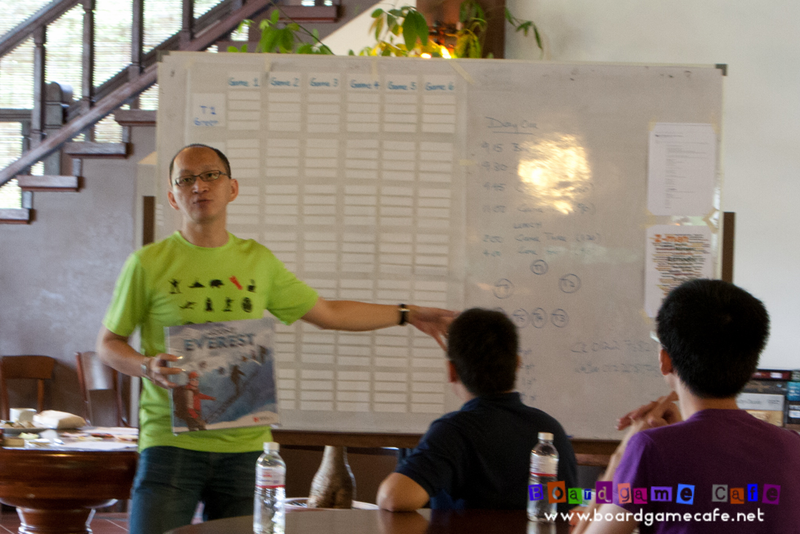 Above: CK explaining how the “world cafe format” works in the Retreat and how to win the Mount Everest game he’s holding. 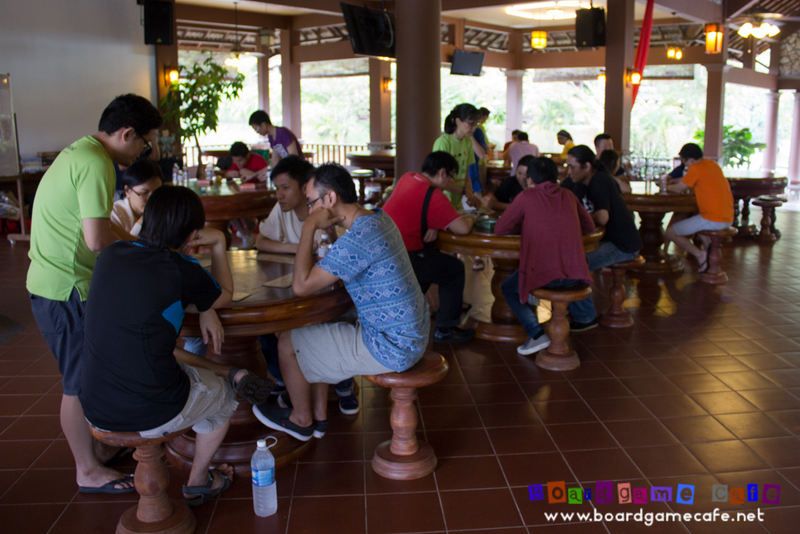 The “world cafe format” also ensures you do not have to be competitive to enjoy the Retreat since gamers would be moved and mixed among the tables as the Retreat progresses, giving them the opportunity to play with as many gamers and different games in the next two days. 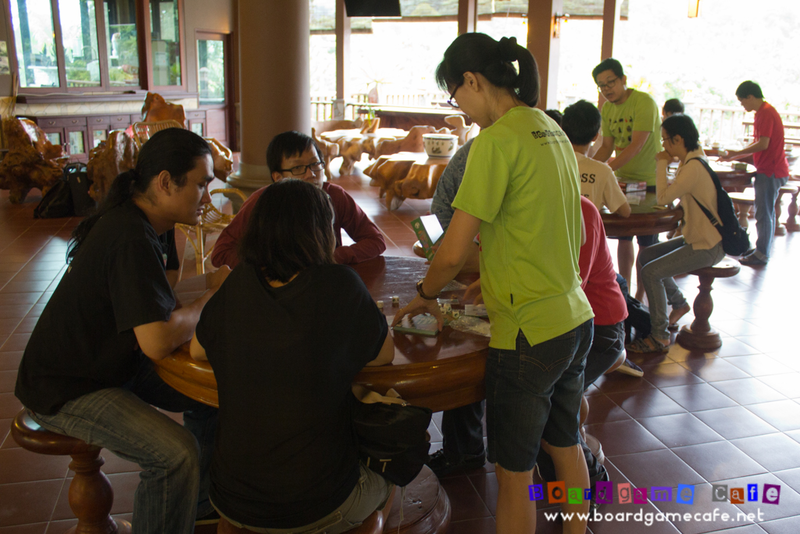 The peeps in green are the Boardgamecafe.net facilitators. Seen above were Aanemesis and CK preparing the scoring board…. 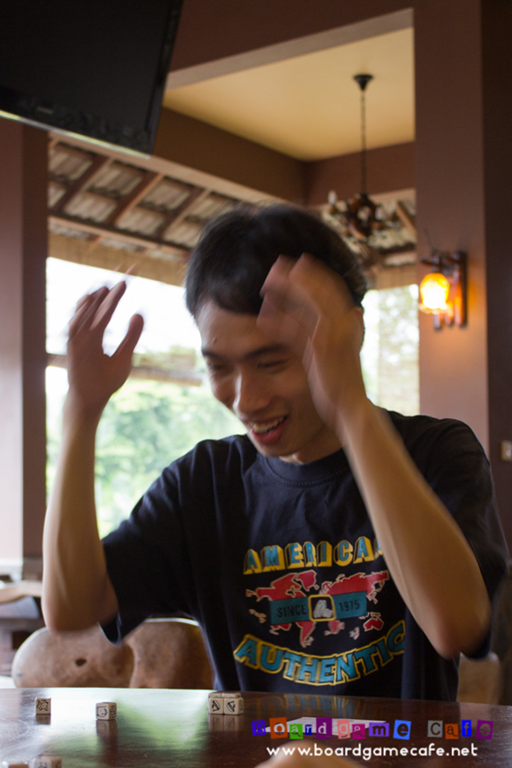 … while the rest of the gamers settled down and get to know each other over breakfast provided by Kin Tick. So Day One’s all set (see programme outline above). Let’s get into Game Zero. 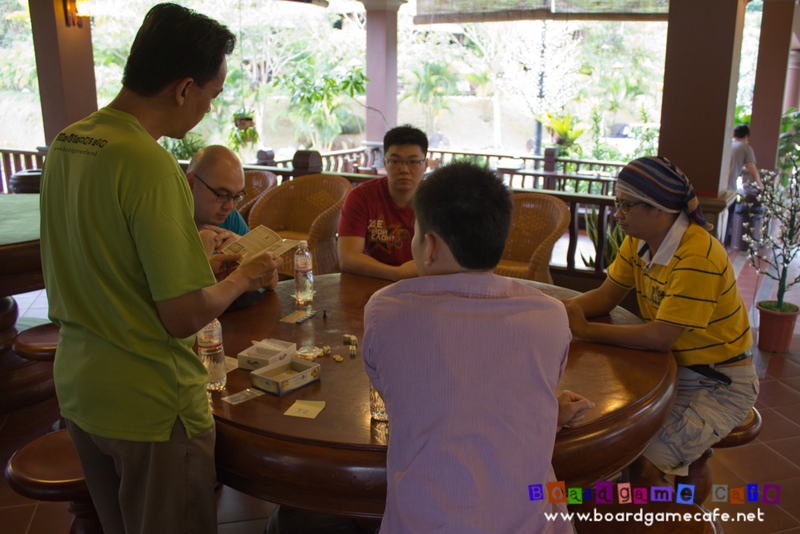 Game Zero is now a traditional norm in our BGC Retreat. 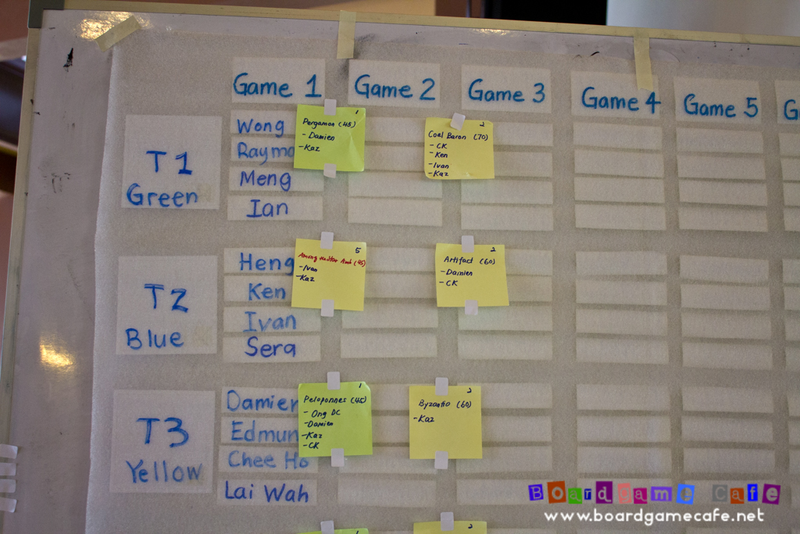 We call it Game Zero since it’s not part of the Retreat Gaming sessions (where points are counted) but it pre-seeds the participants into the respective tables. Game Zero games are light, very easy to learn (and teach) and plays fast, usually in 15 minutes. 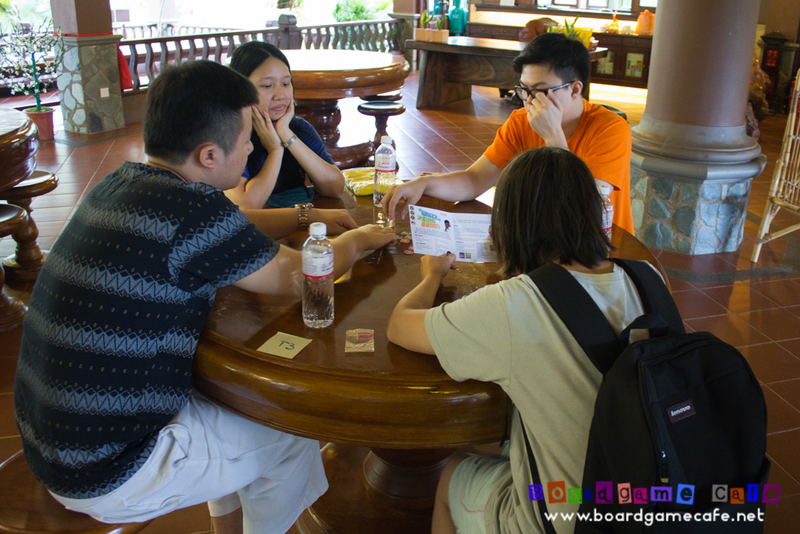 Game Zero is also when the participants get to know each other – if they’ve not already done so. Let’s see what we have for Game Zero! GAME ZERO – TABLE 1: GOTTA GO! The first table featured the fast playing GOTTA GO! card game. 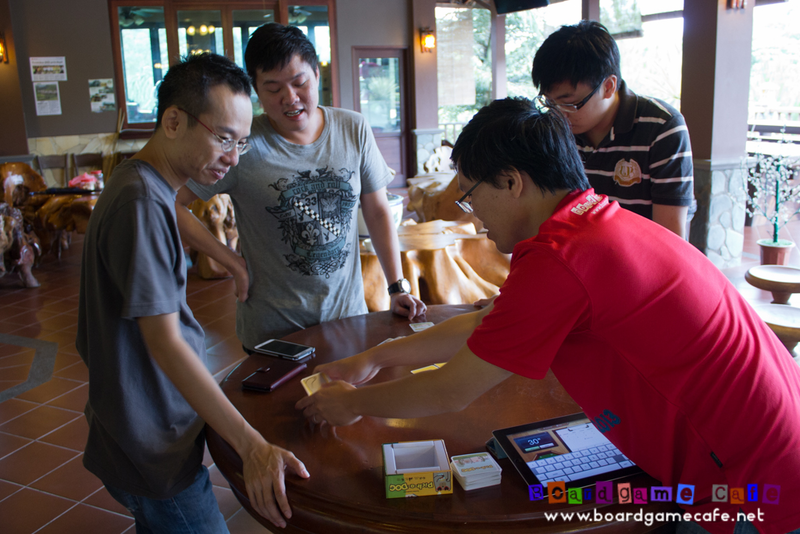 Published by one of our biz partners Swan Panasia (TW), this game plays up to 10! In our Game Zero, we have four frens who were trying their best NOT to be the last one getting out of the restaurant as otherwise the poor fella has to food the entire bill! 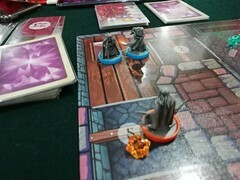 The game is not all about speed (in getting out) since you also need to collect the right set of cards in order to score points. There’s some push your luck element in there as you try to see if you can grab one or two more scoring cards before shouting “Gotta Go!” (and that is assuming you managed to grab the few remaining Gotta Go cards). 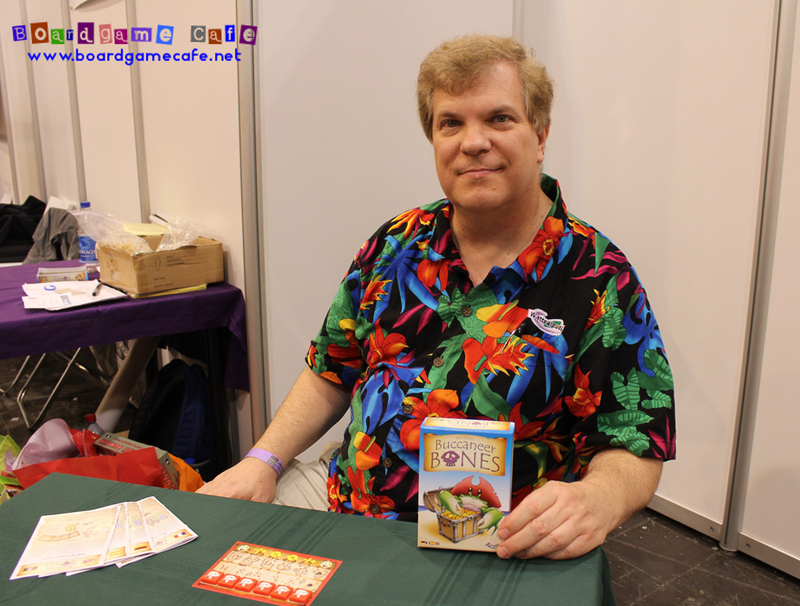 Next up in table 2 was a Kickstarter game that had a limited distribution at Essen Spiel 2013. In fact it sold so well in Essen 2013 that all copies were gone before the convention was over. Above: Aanemesis going thru the rules for Buccaneer Bones. It has the pirate theme, plays very fast. First to grab three treasures win! p/s This is also one of the games I noticed were often requested for the After-8 session (later). Buccaneer Bones would be available from our webstore soon. This is one of Boardgamekids library and published by IELLO. 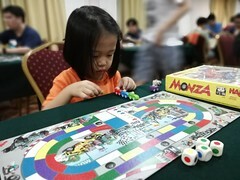 waiyan use these games in her gaming sessions with kids but we find many of them are suitable as Game Zero. 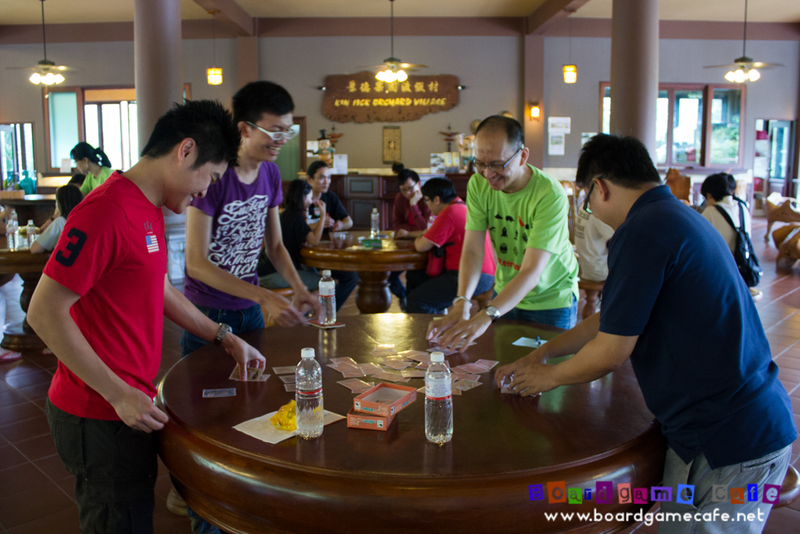 A dexterity type of game, Good for 6, plays fast and perfect as ice breaker game in our Retreat. Whizz Bing Bang was one of IELLO’s 2013 releases, check it out if you game regularly with young children (or adults who dun mind playing as young children). 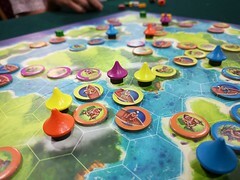 One of waiyan’s fave – and also fitting in with the current trend of “dice-ing” a popular game (re: Bang, Viva Java, Pandemic) but Zooloretto might just have the complete sweep here of being in card form (Coloretto), board (in fact two variant if we include Aquaretto) and dice form. The dice-version of Zooloretto is actually quite fun. 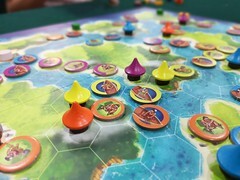 It also plays quite closely to the Zooloretto board game concept so this game might help introduce more gamers into the board version of the game. 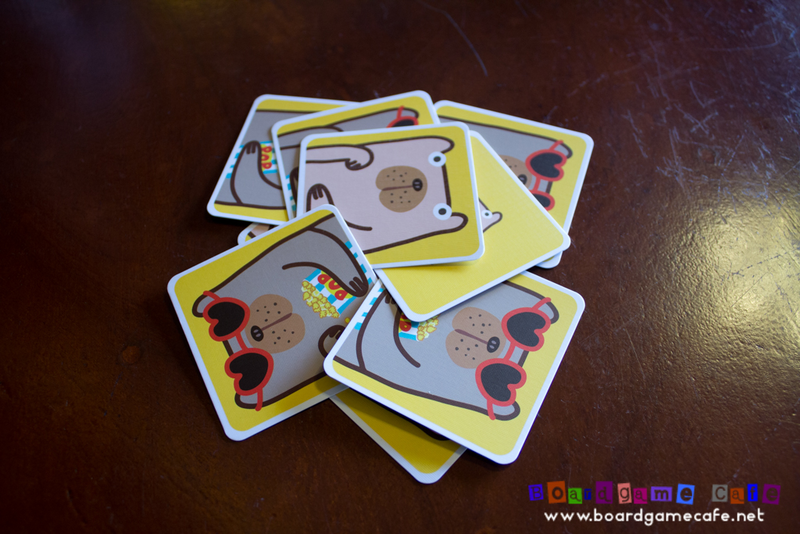 Zooloretto Dice Game is available from our webstore now. 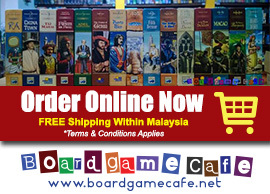 The board game is out of stock at the moment and would be reprinted by Zman in Q3 of 2014. GAME ZERO – TABLE 5: UGO! 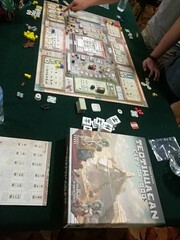 A low profile game from Essen Spiel 2013. It’s essentially a trick taking card game but adds a kingdom board element where you need to manage the cards you collect from winning a trick. I think UGO! is likely to be the “heaviest” of all the other Game Zero games in play. 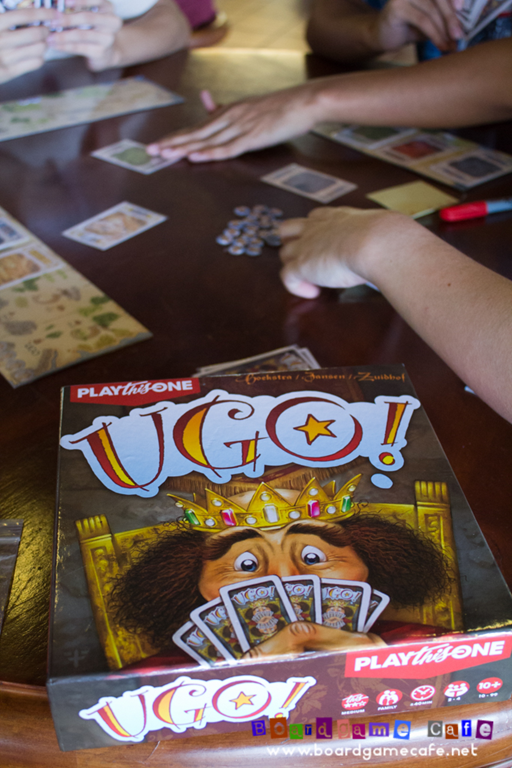 UGO goes beyond trick taking as you do need to plan out your approach since your starting hand is all the cards you’ll get (there’s no additional draw deck). An interesting game, one that grows on you as you play more. Unfortunately since it’s not picked up by a large distributor, we do not yet have copies locally for sale. Will hope to get some in. Table 6 saw Torsten’s popular PICK-A-DOG in play. 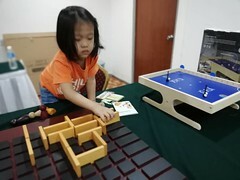 We were playing the English/Chinese version from Jolly Thinkers (HK). If you enjoyed this game, we have three editions for you to choose from – Pick a Pig (the original), Pick a Dog and the latest from Essen 2013 Pick a Polar Bear. This year, they’ll be announcing an expansion Pick-a-Seal at Essen Spiel 2014. 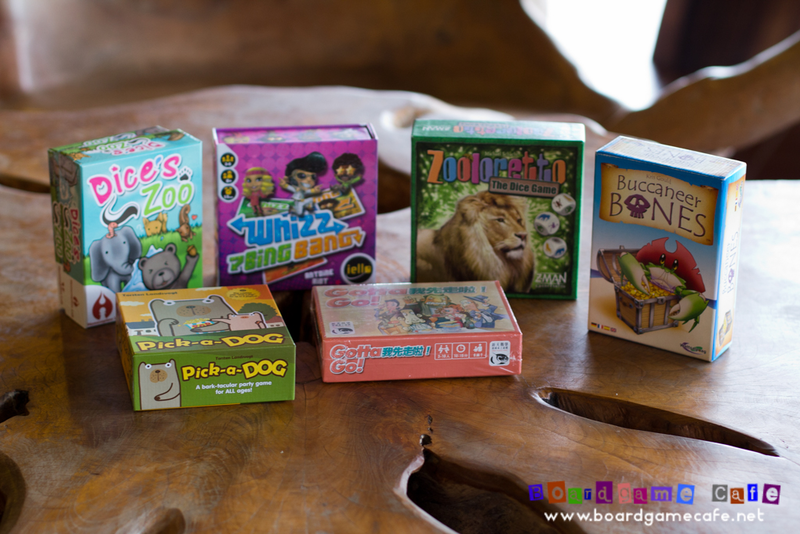 Another game from waiyan’s extensive game library for Boardgamekids – DICE’S ZOO is a game you don’t normally see on most gamer’s tables. 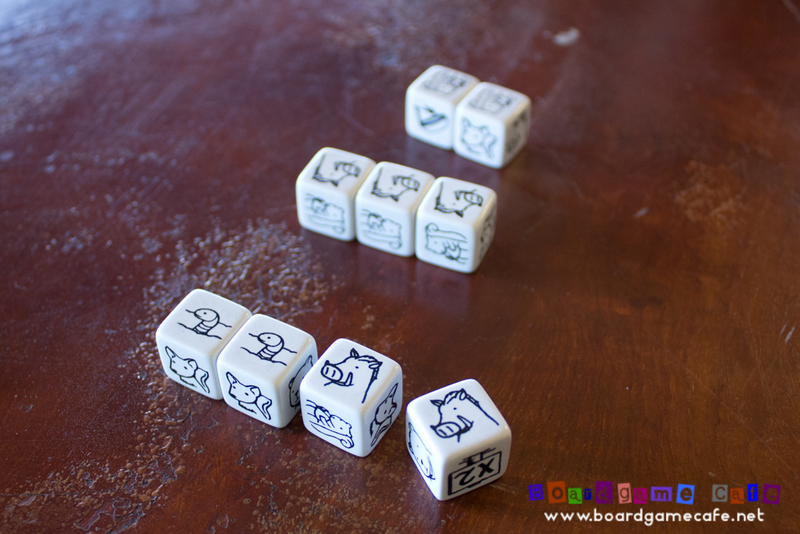 The Zoo theme it shares with Zooloretto Dice is a coincidence but while Zooloretto plays on set matching, Dice’s Zoo is more of trick taking using dice. 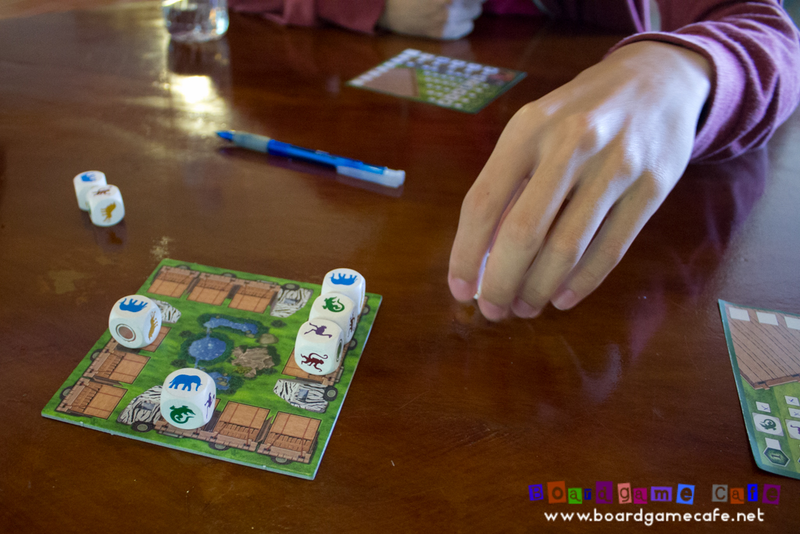 Your aim is to get rid of all the 12 dice in your starting hands… by playing a bigger animal or the same animal with a higher value than the preceding player. We’ve the first Chinese edition in stock (click here to buy). 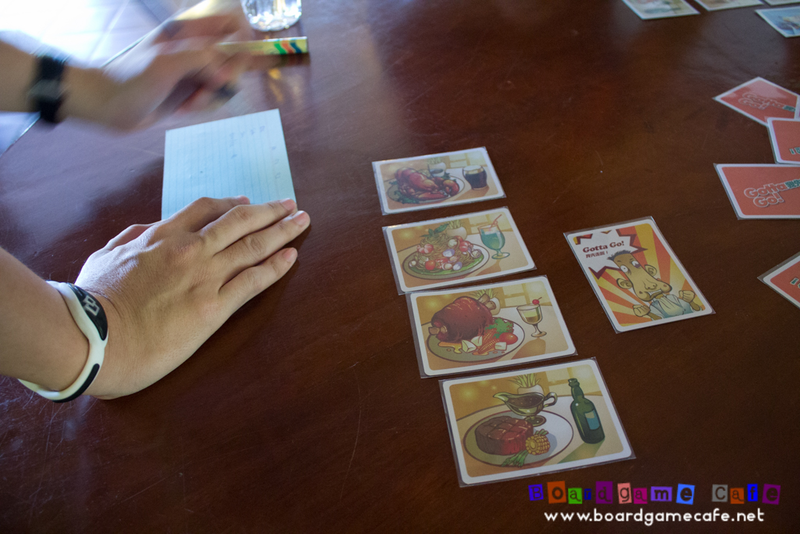 The game is language independent and English rules can be downloaded here. 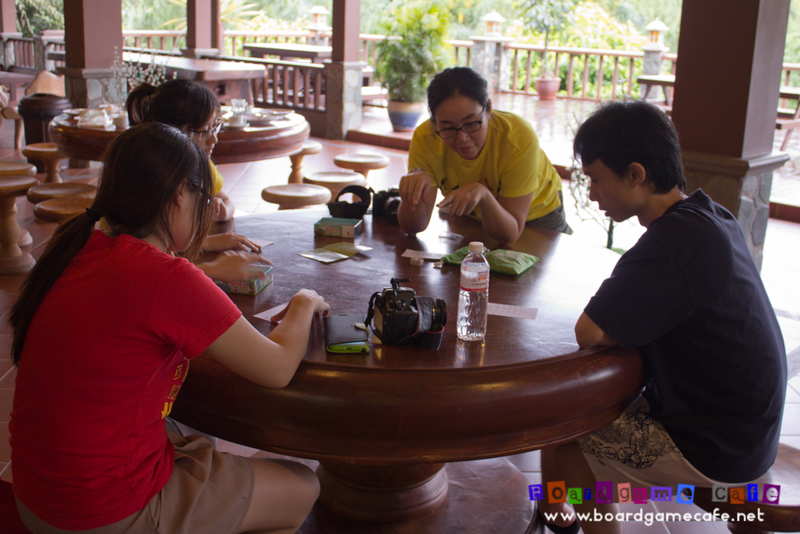 Seven short light fun games played to kickstart the Retreat. 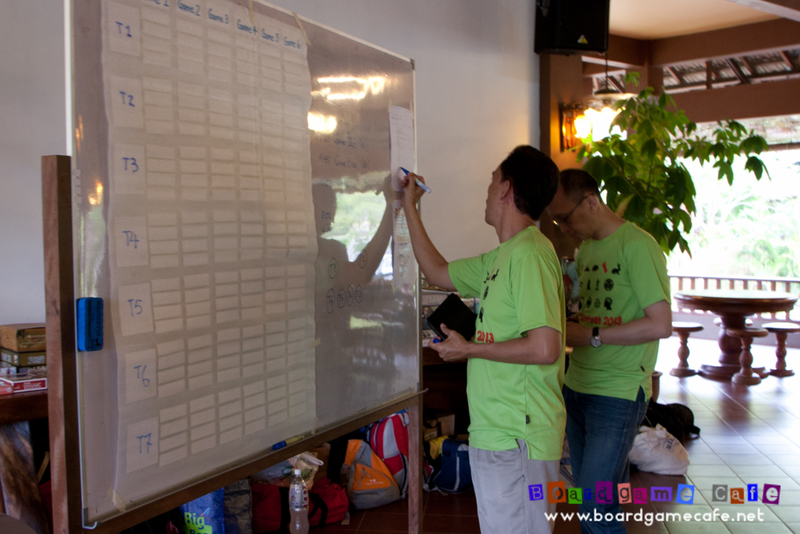 Based on their results in each table, we then seat the players according to a pre-defined sequence. 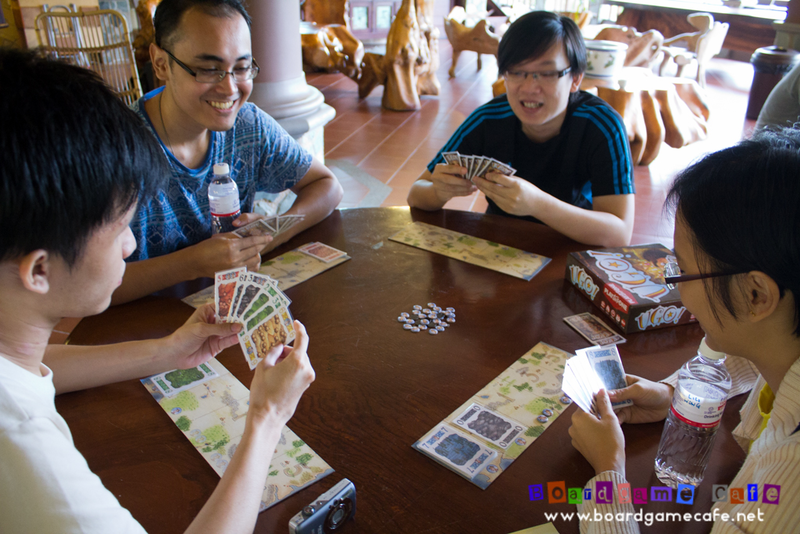 The main reason for doing so was to mix up the group (and not have frens starting the Retreat on the same table). 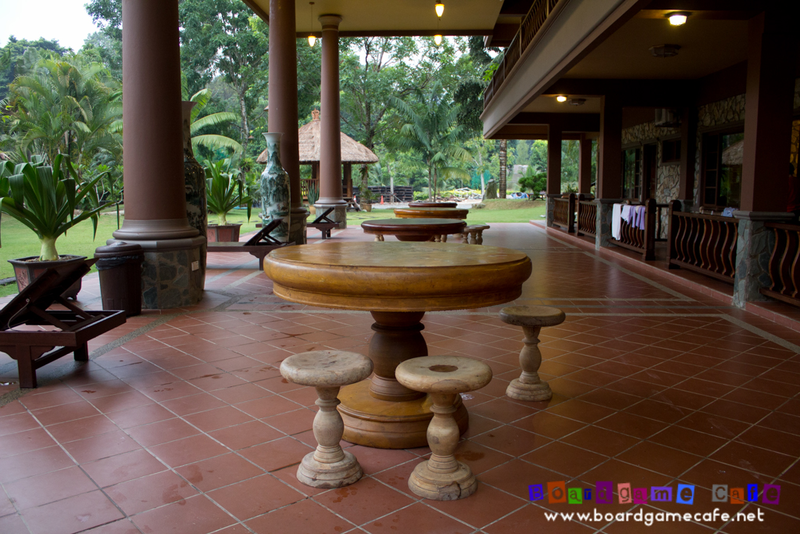 Have you played all of the Retreat’s Game Zero games above? 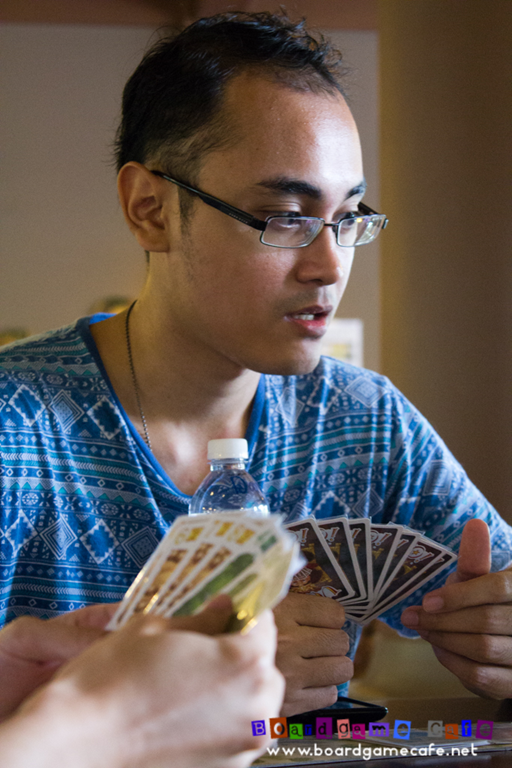 If not ask us for a game next time you drop by OTK Cheras. And that was just Game Zero. 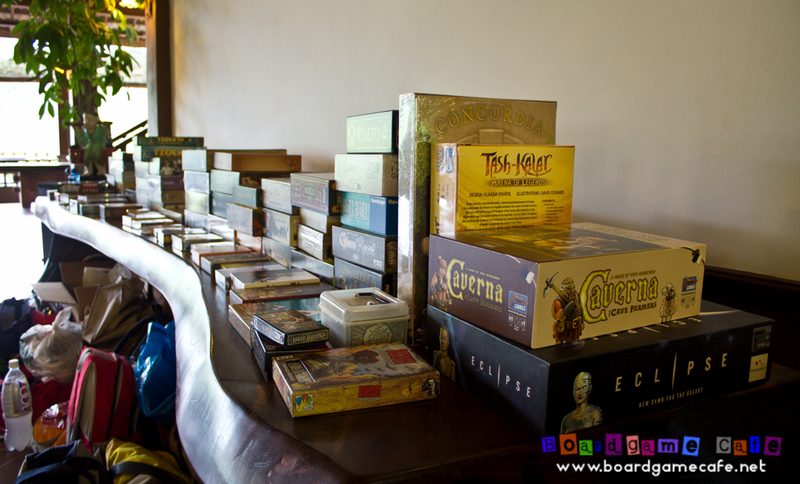 We’ve brought over 80+ games, most of them new releases from Essen Spiel 2013 and would hope to let the gamers play as much of them as possible in these 2-day Retreat. 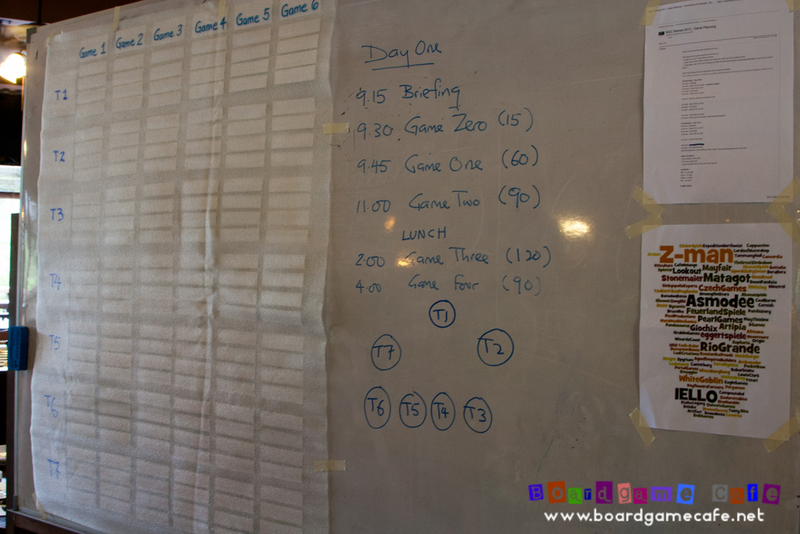 The main reason for Game Zero was to help us seed the tables to kickstart Game One (which signalled the beginning of the scoring rounds). 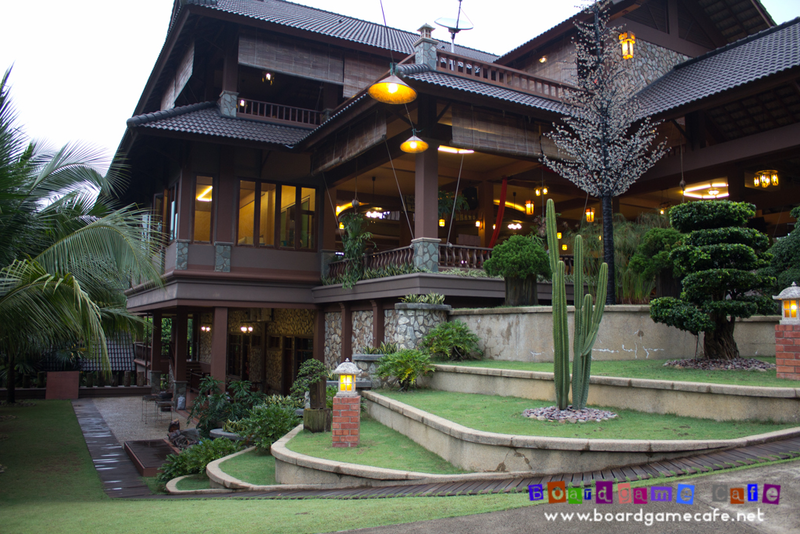 Stay tune for the next installment of this eventrep where you shall find out what’s in store for Game One & Game One of Day 1 of our BGC Boardgame Retreat 2013.